Call 311 to locate a nearby cooling center. The City operates free cooling centers in air-conditioned public facilities during heat waves, with most centers open during the daytime. Utilize a Drop-In Center during the day or evening, or enter shelter at these locations. It is important to note that homeless individuals and families always have a right to shelter in New York City regardless of the weather, but there are expanded outreach and intake rules when Code Red is in effect. Read other tips on staying cool here. Unless you feel unsafe doing so, ask if the person is ok, has someplace to go and needs help. Provide information about the above resources or the Coalition’s Grand Central Food Program (GCFP), which offers food and assistance 365 days of the year – even during dangerous weather. Click here for a list of stops. Call 311 to let the City know that there is a person in need of emergency shelter. The City partners with nonprofit agencies that will send outreach workers to connect the individual to services. If the person seems to require medical attention, call 911 for emergency assistance. 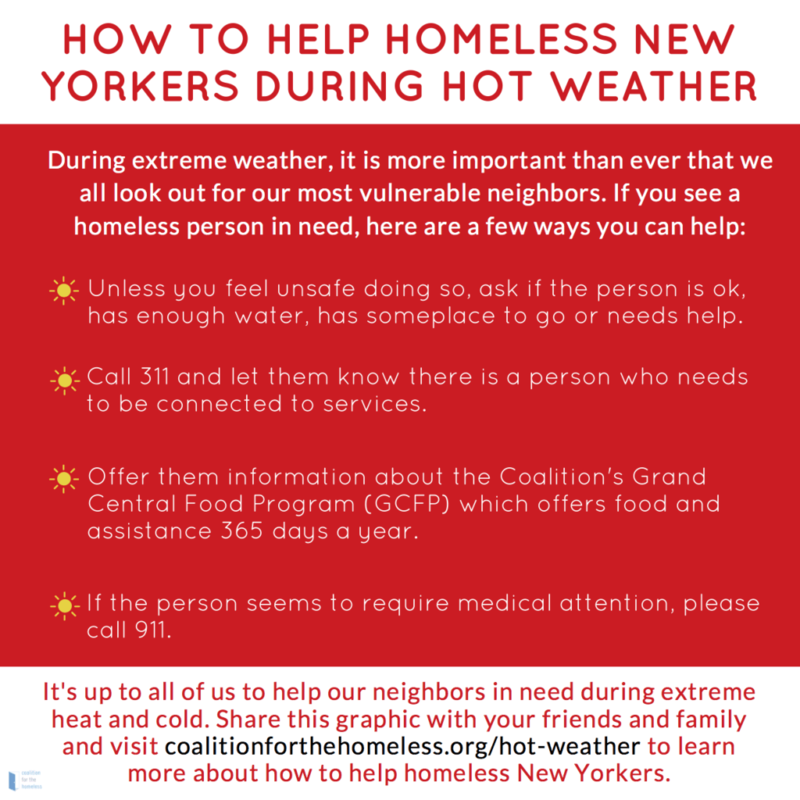 The post Help Homeless New Yorkers During Hot Weather appeared first on Coalition For The Homeless.